A NATURAL BALANCE. FOR THE GOOD OF THE ENVIRONMENT. Beer is more than just a beverage – beer represents an important part of our living culture. Brau Union Österreich places a great deal of emphasis on environmental responsibility. From the field to the bottle and from the grain to the customer, we actively implement measures to protect the environment. Sustainability is integral to all of our processes and accompanies us throughout our day-to-day activities. We continue to develop effective projects and initiatives to make all of our breweries more sustainable. Our strategy is to lower the consumption of energy, raw materials and water, create less waste and minimize CO2 emissions. In doing so, Brau Union Österreich is setting environmental standards for the entire brewing industry – on a domestic level in Austria as well as internationally as a member of the HEINEKEN family. Environmental management systems enable us to systematically address a broad spectrum of environmental topics as a company. Emerging requirements in environmental protection, such as regulations governing energy efficiency, for example, can be integrated into the existing environmental management system. Seven of our breweries have been certified according to the environmental management system, ISO 14001:2015. We operate on a precautionary basis, which means we are improving social and environmental aspects along our value chain on a daily basis. Our carbon footprint – the amount of CO2 released through beer production. The carbon footprint of Brau Union Österreich amounts to 45.6 kg CO2e** per hectoliter of beer which is significantly lower than the average for the HEINEKEN family (64.1 kg CO2e/hl). A comparison with the year 2011 shows that the carbon footprint has increased by 4.6 kg CO2e/hl. This is primarily attributable to the increase in CO2e emissions associated with packaging materials (+ 4.7 kg CO2e/hl) as well as distribution (+ 3.4 kg CO2e/ hl). We are continuously working, together with our suppliers and within the framework of the sustainability agenda for beverage packaging, to develop initiatives which will lead to reductions in the amount of CO2e emissions. In a similar manner, we have already lowered emissions from malting and processing by 2.7 kg CO2e/hl. * Scope 1 and 2 emissions are measured annually and can be found in the Appendix. Scope 3 emissions are only calculated for the purpose of the three-year carbon footprint and are not available in detail. The next upcoming calculation will be performed for the year 2017. What we look for in procurement. Utilization of sustainable raw materials from Austria shortens transport distances and lowers the impact on the environment. In addition, it helps us secure jobs in Austria and creates value in the local economy. Our yeast is propagated in Austria according to the highest hygiene standards. Just like the purity of the water we use to brew our beer, which comes ex­clusively from protected, local water sources, more than 82% of our malt is made from malting barley cultivated in Austria, while 93% of our hops are grown in the country. Gösser beer is brewed exclusively (100%) with raw materials from Austria, which is why it has been awarded the AMA quality seal, easily recognized by its characteristic red-white-red pattern. Those interested in a purely organic beer made with 100% raw materials from Austria need look no further than our products brewed by our specialty brewery Schladming. We choose the most environmentally friendly options for our packaging and use recycled materials whenever possible. This reduces our carbon footprint considerably – since at 36%, packaging material produces the most CO2e emissions. In 2016, our products were packaged as follows: Based on the volume filled in hectoliters, ­reusable glass bottles make up the largest proportion of our packaging at 45.6%. Cans are in second place at 24.3% followed by kegs in third place at 19.7%. 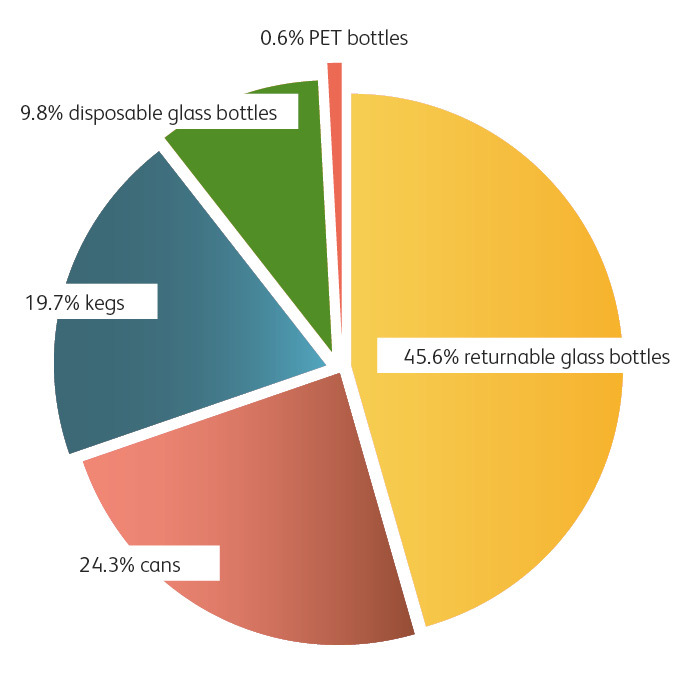 The remainder is divided between disposable glass bottles and PET bottles. Expressed in different terms, more than 65% of our beer reaches consumers in environmentally friendly reusable containers (returnable bottles and kegs). Only 34.7% is packaged in disposable containers, disposable bottles, PET ­bottles or cans. In order to minimize the environmental impact of our packaging, we require that suppliers strive to increase the percentage of ­secondary raw materials used in our packaging. The goal of our “Green ­Packaging” initiative is to find more ­efficient packaging solutions. With the aid of life ­cycle ­analysis, we constantly seek to reduce the weight of our packaging. This is equally applicable to the design, size and method of production for each type of package. Working together with our suppliers, this allowed us to reduce the weight of bottles, can lids and cardboard cartons in 2016. CDL lids replaced the previous can lids (weight reduction of 10%). Instead of individual cartons, trays are now used (this saves around 50% of the weight of the cardboard). Brau Union Österreich supports the campaign for returnable containers: “Returnable Hero” sought. The Federal Ministry of Agriculture, ­Forestry, Environment and Water Management (BMLFUW) in Austria brought the reusable bottle back into the limelight in 2016. Following the successful launch of the initiative “Sag’s am Mehrweg”, the campaign will now be continued under the title “Österreich sucht den ­Mehrweg-Hero” (Austria is seeking the reusable hero). The advertising campaign will recognize the most industrious “reusable heroes” and draw attention to the smart reusable ­bottle with cool sayings and messages – in an effort to shift consumer attention back to this ecological model student. The project is also supported by Brau ­Union Österreich, which is participating in the campaign with its Gösser, Zipfer and ­Puntigamer brands. All suppliers, with which we regularly conduct business, are required to sign our HEINEKEN Supplier Code, agreeing to comply with the defined values and ­principles concerning human rights, occupational safety and environmental protection as outlined in the code. Our suppliers are assessed on the basis of an internal risk analysis and classified into risk groups. Suppliers in high-risk groups must undergo an assessment by EcoVadis. Finally, if deemed necessary, a plan with corrective measures to improve the CSR performance of the supplier can be drafted. In 2016, thirteen of our 2,090 suppliers, which were classified as high-risk, all successfully passed the EcoVadis assessment. Refusal to sign the agreement or failure to uphold the stipulations in the code can lead to termination of business relations. We have created “environmental teams” at all of our locations. Their task, as part of our TPM (Total Productive Management) process, is to reduce the amount of waste generated, to seek recycling options and to ensure the correct disposal of the remaining waste. A total of 105,262.57 tons of waste material – consisting of spent grains, waste yeast, cardboard, glass, cans and commercial waste – was generated in 2016. This represents an increase of 2.5% compared to the previous year. The reason for the increase was due to a correspondingly higher production volume. All disposable packaging at Brau Union Österreich is licensed by Altstoff Recycling Austria AG. After collection, the packaging is recycled through thermal or material means. This enabled us to once again achieve a recycling rate* of 100% in 2016. Both internal and external audits monitor whether we are disposing of our waste in accordance with regulations governing waste disposal and the legislative requirements for reporting. The residues from beer production are also utilized in a wide variety of ways. A large proportion of the spent grains and waste yeast are used as animal feed supplements or as fertilizer in agricultural applications. In order to ensure that the feed is of the highest quality, seven of our production facilities have been certified according to the AMA feed guidelines Pastus+. In 2016, we sponsored a number of initiatives, among them, the “Ö3 Wunder­tüte” initiative. Around 250 mobile phones and accessories, which were destined to be retired from the company inventory, were donated. This initiative not only ensured that the mobile phones were disposed of in an environmentally friendly and legally compliant manner, the recycling proceeds went to the immediate response fund “Licht ins ­Dunkel” and the charity organization Caritas which benefit people in need. * According to the HEINEKEN definition, recycling means the appropriate disposal of 100% of waste in the manner required by law. Furthermore, waste should be recycled through suitable recycling channels, if they are available, to recover the material to the greatest extent. Water is our most important raw material. We do everything possible to protect it. No other raw material in beer production is as important as water. Our water comes exclusively from Austria –from deep wells and springs. Brau Union Österreich owns water wells at all of its production facilities except for the breweries located in Schladming and Kaltenhausen. We have established water protection areas to keep our water pure and to prevent any negative impacts on the environment. We carefully monitor the quality of the water. All of the water used in our production process fulfills the legislative requirements for potable water or “water suitable for human consumption”.We constantly work to reduce our water consumption and have implemented conservation measures in all of our breweries. Since 2008, we have decreased our specific water consumption by 43.9%. At 3.2 hl water per hl of beer, our specific water consumption value is one of the lowest, and therefore one of the best, in the world. On average, the HEINEKEN family consumes around 3.6 hl water per hl of beer produced. We are committed to recycling all of our process water and reintroducing it to the hydrologic cycle. Specific limits are defined in the regulations governing the emissions allowable in effluent. This is even more significant as some of our breweries are located in sensitive watershed areas. For instance, Schwechat ­borders the Danube floodplain national park, Wieselburg on the Natura 2000 Erlauf floodplain and Göss has its own protected reserve for natural springs. We also protect and promote biodiversity in natural aquatic habitats, for example by building fish ladders in Zipf (Redl) and Wieselburg (Erlauf). How we save energy and reduce our CO2 emissions. Saving energy and conserving resources have always been a high priority and a long tradition at Brau Union Österreich. We utilize “green” electricity almost exclusively. Energy consumption in our production areas is constantly monitored – both internally and externally, supplying us with the data necessary to implement further improvements. 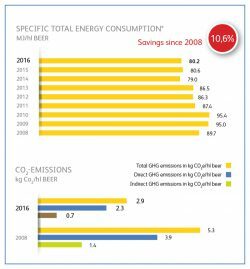 According to the new laws on energy efficiency which went into effect on 1st January 2015, as a company with more than 250 employees, Brau Union Österreich must demonstrate an energy savings of 0.6% annually. This requires implementation of an integrated environmental and energy management system, internal audits and training internal energy auditors as well as reporting the measures implemented to a monitoring agency. Our full-time truck drivers are also trained to find ways to increase energy efficiency – at least every five years, our drivers must attend a training session on ways to save fuel as part of the federally mandated C95 training. Our “Car Policy” stipulates that company vehicles must be low in emissions. Our logistics operations are organized by region to minimize transport and we make an effort to limit transport distances whenever possible. According to the ­Carbon Footprint Report, 17% of all emissions are generated by transport, so we only dispatch the number of trucks we need on a given day to cover the volume of sales. Ongoing measures include replacing gas and diesel-powered forklifts with electric ones and investing in low-emission EURO6 trucks to replace older trucks. Staying at the forefront of alternative fuel sources, we now have two trucks powered by natural gas at the Göss Brewery. With the “Green Cooling Initiative”, together with our suppliers, we are working on innovative refrigeration technologies for keeping beverages cool. 100% of our refrigeration equipment used by our ­customers in trade outlets for food or in restaurants complies with our internal guidelines on “Green Cooling”. The guidelines prescribe the refrigerant to be used, the life cycle of the equipment, the illumination, the fans and the integration of an energy saving system. 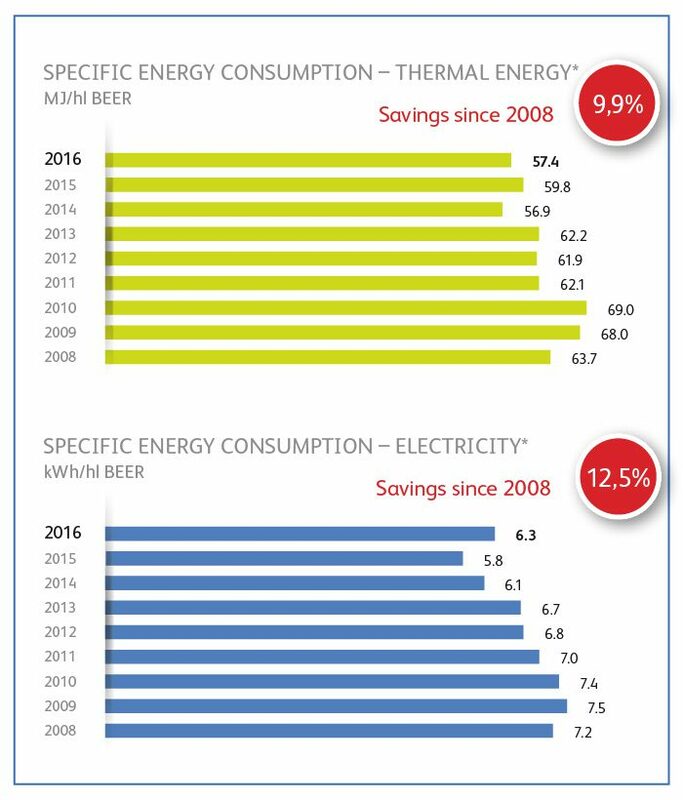 Since the baseline year of 2008, we have been able to reduce our specific total energy consumption by more than 10% (thermal energy -9.9%, electricity -12.5% per hectoliter of beer). We achieved these reductions due to our desire for continuous improvement by implementing a series of measures designed to save energy and increase energy efficiency. During the reporting year 2016, we were also able to identify further options for reducing energy consumption. Through concrete projects carried out at individual locations, our specific total energy consumption was lowered to 80.2 MJ per hectoliter of beer. A comparison of our energy consumption value to the average value for HEINEKEN (91 MJ/hl beer) demonstrates how impressive this achievement is, also when compared to others on the international arena. Thanks to greater utilization of renewable energy sources, a low output of 2.93 kg CO2e/hectoliter beer was attained in production. This represents a 45.3% reduction of CO2 emissions since 2008. The value for CO2 emissions is a combination of direct emissions (combustion of fossil fuels) and indirect emissions (from the purchase of electricity and a community heating project generated with fossil ­fuels). With regard to the HEINEKEN goal of 6.4 kg CO2e/hectoliter of beer set for the year 2020, it is apparent that we are in an excellent position since our value is well below the target value. We will once again implement measures in the coming year, to further reduce our direct emissions (2.27 kg CO2e/hl beer) as well as indirect (0.66 kg CO2e/hl beer) CO2 emissions. Brau Union Österreich values openness and transparency. In November 2016, the planning phase began for an information session concerning the wastewater treatment plant at the Göss Brewery. The motivation to hold this session arose from a citizens’ initiative organized by residents near the brewery who are worried that the operation of a wastewater plant nearby will lower their quality of life. The date for the session was set for 17th January 2017. Technical presentations at the event were given by Univ.-Prof. Dipl.-Ing. Dr.-Ing. Markus Lehner, director of the Chair for Process Technology and Industrial Environmental Protection at the Montanuniversität Leoben and assistant professor Dipl.-Ing. Dr.mont. Markus Ellersdorfer. As part of the information session, DI Dr. Michael Resch, director of the Reinhaltungsverband Leoben (association dedicated to controlling pollution in Leoben), answered questions posed by those in attendance. Energy from spent grains. Since the end of 2015, we have been generating ­energy at the Göss brewery through the fermentation of production residues, i.e. spent grains. This energy is used for steam generation for subsequent conversion to ­electricity. The residues from the spent grain fermentation system can be applied as a high quality fertilizer. Can collection campaign. Again in 2016, the Zipf brewery helped keep the ­environment clean by organizing another can exchange initiative during the FM4 Frequency Festival. Around 60,000 cans were collected and presented to the city administration of St. Pölten to be recycled. In order to reduce the consumption of chemicals and water at the Schwechat Brewery, we commissioned a new brewing liquor treatment unit in 2016. It functions according to the principle of reverse osmosis and significantly reduces the amount of chemicals consumed. Water treatment at the brewery can now be carried out without any hydrochloric acid. At the Puntigam brewery, we were able to reduce the amount of water consumption as well as the amount of belt lubricant by optimizing the belt lubrication system. In addition, a new cleaning and monitoring program has lowered water consumption in our bottle washer. The project “Brauquartier Puntigam”: Heat generated by the fermentation process at the Puntigam Brewery will be used to heat approximately 800 apartments along with ­offices, ­businesses and a kindergarten in the new “Brauquartier ­Puntigam” (brewery quarter). 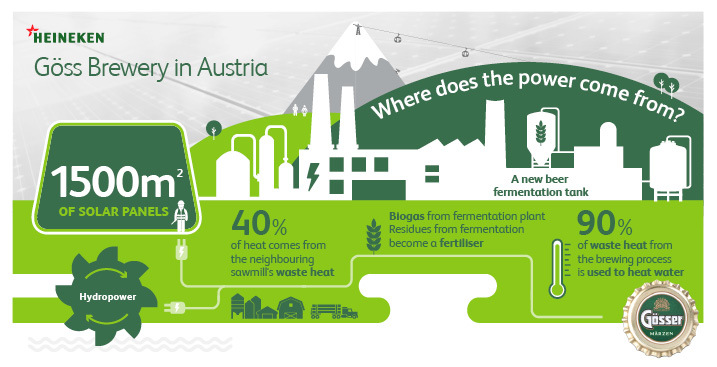 Waste heat utilization project at Schwechat: Heat ­generated at the Schwechat Brewery during fermentation is used to heat around 900 apartments located on the Schwechat “brewery property”. Logistics: The primary objectives are cooperation with freight companies (for supplies), put EURO6 trucks and lightweight trailers into circulation. Geothermal energy at Zipf: the conception phase is continuing. Our goal is to actively drive implementation of projects to improve energy systems and expend more effort to achieve a CO2-neutral production process at all locations.